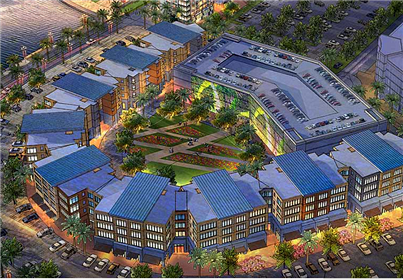 After years of debate and a multi-hour City Council meeting that reportedly dragged on past midnight, the Penn-Florida project known as “University Village” was finally approved on Wednesday, November 25th. You can see renderings of this ambitious project HERE. Here’s the quick rundown, details via the Boca Raton Blog and the Sun Sentinel: Housing, retail, restaurants, grocery store, 185-room hotel, office space, live performance space, pocket parks, maybe more. The tallest building could be 85 feet (a little taller than our newest dorms). My understanding is that it will likely be built in phases and the first phase should come to light in the next two years…. sooner than the 20th Street renovation. You can see the Master Plan PDF proposed to the City Council HERE. Page 5 shows the Master Plan as of right now. Technically it’s considered a “Planned Mobility Project” which means it’s intended to draw in Millenials/young professionals and their families to Boca Raton in the hopes they can live here and get around primarily using public transportation. To that end a transit hub will be included - a place where people can get on/off shuttles to go to Tri-Rail/Palm Tran/possibly to campus itself (if FAU is smart, they’ll run shuttles back and forth there and down 20th Street). Now, the development is called “University Village” because it is adjacent to campus on the north side by the Spanish River Blvd entrance to FAU. More specifically, the entrance to University Village will be at the intersection of NW 6th Way and Spanish River Blvd, across the street from Vistazo. It would be about a 20 minute walk from Innovation Village North (or 5 minute bike/car ride). Again, if they’re smart FAU would run shuttles there once it is built so you wouldn’t have to worry about a 20 minute walk in 90 degree heat. Ironically, despite the name, this isn’t intended for college students. While they do want to attract FAU faculty and staff the project was ultimately approved with a stipulation that no student housing be built there. Once again the local community argued that, essentially, unruly drunk partying undergraduates would ruin the property for everyone else. This kind of blatant student discrimination in our community is both overblown and counterproductive. First of all, a development with restaurants and shopping across the street from a college campus is going to attract students there. It makes no sense to cut out that huge demographic IN THEIR BACKYARD. Sure, you can restrict development of specifically-designated student housing projects like University Park – which mind you has not had a single incident of unruly undergraduates in the news that I’ve seen in its 6 months of existence – but if you build housing near campus and you have landlords who like making money, students are going to live there. Look at Vistazo. Look at basically every apartment complex in Boca. Look at the single family homes east of University Park along Dixie. It’s inevitable. Second of all, the City has had meeting after meeting where they talked about how they need dedicated student housing in Boca Raton to get the students out of spaces like that “where they’re not intended” and put them somewhere more appropriate, and here’s this huge project which could have at least one student housing building on it – doesn’t have to be a bunch of them, just one - and instead they buckle because of discrimination against college students. Worse, they’ve also had meeting after meeting about how to unclog all the traffic on Glades going to/from FAU, and here is an opportunity to take hundreds of cars off that road by having students just come over from University Village instead – a wasted opportunity. You could argue that this creates a distinction between University Village and the forthcoming 20th Street Renovation which is supposed to include a lot of student housing… but why not both? There’s a limited amount of land surrounding campus, the university is not going anywhere, the traffic is bad around campus because we force so many students to come in from Boynton, Delray, Coral Springs, Fort Lauderdale, etc all around the same time, so the solution so obvious you can see it from space is to maximize student housing opportunities surrounding campus to take traffic off Glades. End rant. Let’s focus on positives. A huge new Mizner-type space will open across from campus. It may have chain stores, but that isn’t necessarily a bad thing if that means a new Chipotle or a Bru’s Room. It will be a cool place for students to hang out. Some will even live there. And come recruiting time, it will absolutely pay off dividends when recruits see not only the stadium and the new Athletic Complex but also University Village (and eventually 20th Street). This is big for us. And the best part is that we don’t even have to pay for it. As you probably know by now, Student Government was given the go-ahead by the City of Boca Raton to poll FAU students on their suggestions for renaming 20th Street. SGA took to Twitter and marketed the hashtag #rename20th to everyone, the results of which you can see HERE even if you don’t have Twitter. Rosemurgy and Park Partners, who have a vested interest in the name since they have three properties along it (University View (formerly Addison Park), University Park and University Square), offered up Varsity Drive on Oct.19th, about a week after SGA closed the polls and said they were taking the most popular suggestions to both the City Council and FAU administration. Another business with a vested interest in the name, It’s Owl Time, had their suggestion of Florida Atlantic Way tied for fourth place with 13 votes (counted by me as total favorites plus retweets on the original post). Only counting votes for the original posts of an idea, it looks like the top 3 choices were Owl Avenue (26 total favorites/retweets) via Shalom Ogbonda, Atlantic Way (23), Night Owl Street (18) with three suggestions after that tied at 13 votes: Owl Avenue, Owlsley Ave, Florida Atlantic Way. Owl Avenue was actually suggested by several different people. Honestly, Owl Avenue wouldn’t be bad at all. It’s short and to the point, plus it very clearly indicates the relationship between the street and the intended demographic of FAU students. I understand fauowl’s point about the prestige of a “Florida Atlantic” Way mailing address for the businesses there, and we might be wasting an opportunity if we don’t drive home the “Collegetown” idea in the name, but we could definitely do worse than Owl Avenue. Remember that road names don’t get changed often so this could be the road’s name for the next 50 years. I hope the people who voted and SGA can appreciate the gravity of that decision. So let’s do it right. For the first time in as long as I can remember, FAU elected NOT to raise its Housing rates for the 2016-2017 fiscal year during its Full Board Meeting back on November 12th. Traditionally the cheapest dorm was Algonquin since it was the oldest, although my understanding is that it hasn’t been available to freshmen who were instead re-routed to newer dorms like HPT, GPT and IVA to not only help pay back the debt on those buildings but also because that’s where the Living Learning Communities were located. Originally I set out to congratulate FAU for not raising the rates because raising the rates puts an increased burden on students and further exacerbates the disconnect between the students and the university when it comes time to ask for alumni donations – that is to say, if FAU students already felt like they were nickel and dimed for everything during their college tenure, they’re not going to donate, and every time rates and fees increase the students bellyache about it. So it’s nice to see the rate hold steady. But in researching the rates I discovered that the FAU Housing Tour website doesn’t even SHOW Algonquin as an option this upcoming year. It’s left off the tour site, the rate comparison site, etc so either it’s undergoing renovation (unlikely since the last renovation was a mere four years ago in 2011) or they’re clearing the space for other reasons. Is the almighty Gonq, the last of the original dorms, finally on its way out? Granted, this is speculation. I haven’t heard/seen anything official and maybe it’s nothing but there’s certainly been talk of doing so in recent years. It was considered “safe” because the debt was supposedly paid off (it was originally built back in 1965), though my understanding was that FAU had eyed both that space and the current Housing office for a new HPT-type of building. To that end, Student Government had unanimously passed legislation called “Preserving a Landmark” back in 2012 that opposed the demolition of Algonquin, which I agreed with. But if you WERE going to demolish Algonquin, the first step would be to phase out the residents, and to phase out residents you simply don’t renew their annual contract. The strange thing about all this is that President Kelly has said, on a few different occasions now, that he does not want to build any more housing on-campus, instead leaving it to the private market to take care of off-campus to help foster more of that college town atmosphere. Can’t fault that idea. So if it’s not for housing, what would they demolish Algonquin for? The only other thing I’d ever seen proposed for that space was the Recreation Center, now located at the north end of the Breezeway. If I had to guess, you could potentially use that as office space (as an annex of sorts off the Student Services or Student Union buildings). You could tear down Algonquin and build more parking there though that would be a waste. From a heritage standpoint it might be ideally positioned to be remodeled into an FAU museum of sorts though as much as it pains me to admit it I doubt there’s enough public interest to justify that cost; any museum would have to be part of a larger structure like the Student Union or the stadium. You could maybe justify demolishing Algonquin to build recreational space like tennis courts, basketball courts, or a pool, since the first two are located half a campus away from people who would actually use them, and you can never have too many pools in South Florida apparently. Housing’s Annual Report is unavailable on their website. Can’t find anything through the fau.edu website either. I’ve sent out some emails and update this if I get any responses or hear anything official otherwise. This is good for the city and the university. will bring housing and jobs to the city and area.